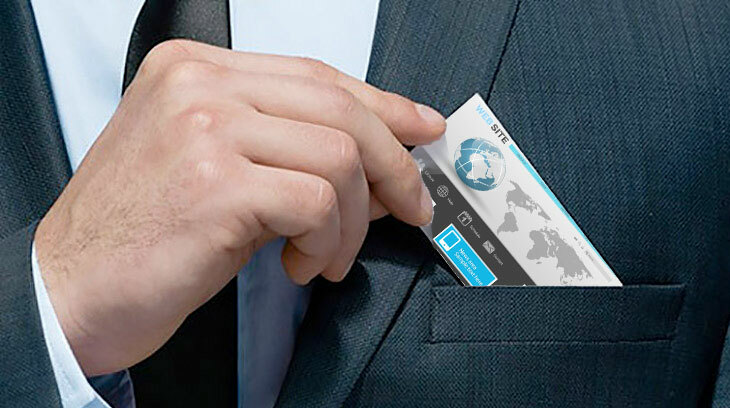 A website IS your digital business card. If you have a business then clearly you need an excellent website, here's why. I have run into many companies that sell great products, have a trusted brand but their sub-par website has been dormant for 10 or more years. These owners don't understand or appreciate the purpose of a modern, well designed site. They are focussed on other day to day costs and issues of running their business. Many will say that "my site has never brought me any business". That is a poor argument, of course that is true if you have a poor website. The more accurate response should be "Do you know many customers have you lost visiting your (abandoned) website?" I'd say most of them. In many cases, these business sell B2B. I've observed that many of these businesses have no regular advertising strategies. They have built their client base by making good products, at a competitive price and by building relationships. So they haven't won any customers via their website or through advertising. They did by creating relationships. Many companies will hire a salesperson or team to hit the pavement to development these relationships. What is the first thing a owner of salesperson will do when introducing themselves to a potential new customer? They will hand them their business card. What is the purpose of that card? It establishes your brand, your contact info like phone number, email address, brick and mortar address and most likely your website. What do many people do today when they receive a new card. They scan or input the data into their phone or contact list. Some businesses will make this step easier by adding a QR code for easier input into a smart phone. So a traditional business card is still a valid tool but now it's just an intermediate step to trade information yet to be digitized. Once your new customer has you in their digital rolodex they can call you with the touch of a button but what happens when they click the link to your site. Will they be excited to explore your business and all of your offerings or will they be turned off and wonder if your site is a reflection on the health of your business? I can understand the financial concerns. A box of business cards can cost a few hundred dollars yet a simple, effective website can be at least a few thousand and usually much more. Ask yourself though, how much do you spend on advertising each year? How often do you ring the church bell to remind everyone that your doors are open for service? In many cases a company's website is their only means of advertising. Facebook has become a new way to reach customers but it should be a secondary tool if you are serious about business. Could you imagine being handed a business card and the only website listed was a Facebook account? It can be effective for a few home-run businesses but it shouldn't be your only means of reaching customers. Imagine if you are a handy-man, a plumber or a mechanic. A lot of times you win business by word-of-mouth. In the old days (not too long ago) people might find you in the yellow pages. Who got most of those calls, the single line phone number entry or the larger graphic that listed the services, had a little location map and maybe a picture or two to win your confidence? I usually picked the eye-appealing graphic that looked qualified but not too expensive. Why would I choose the single line entry that said nothing about their business? Are they serious? Do they know what they are doing? Will they still be in business next week? So what has replaced that thick yellow book that no one uses anymore? Google. Will Google find your website if someone is looking for what you have to sell? Can I guarantee that new, unsolicited traffic will visit your site? Unfortunately, no I can't. SEO has become big business to try and place the odds in your favour. Google has made it much more complicated to come even close to ranking on first page. I should know because I've been fighting that battle for quite some time. Quality backlinks to your page from important trusted sites is part of the secret. Anyone know of a way to convince a University or a Top 100 website to link to your page? I certainly don't. Why is it tough? Because Google wants you to pay for it. Have you heard of Adwords? Google wants you to spends $1000's of dollars to outrank your competition. They will put you on Page 1 or 2 if you buy Adword placement and target some keywords that will interest your potential customers. Of course, the savvy user knows not to click on the paid for links above and below the organic Google results so how are you to win this battle? Well for some companies it is important to constantly invest in SEO efforts to organically rank on the first page or so. If that is working for you then congratulations you have beat the odds. 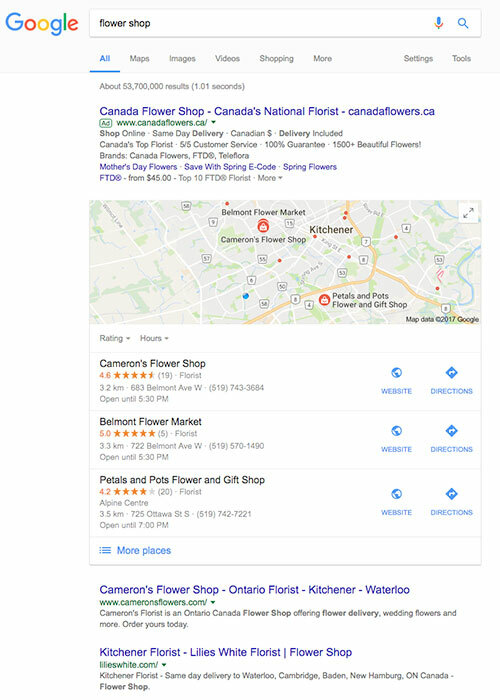 Searching for "Flower Shop" brought up 53 million results and local results started dropping by page 5. 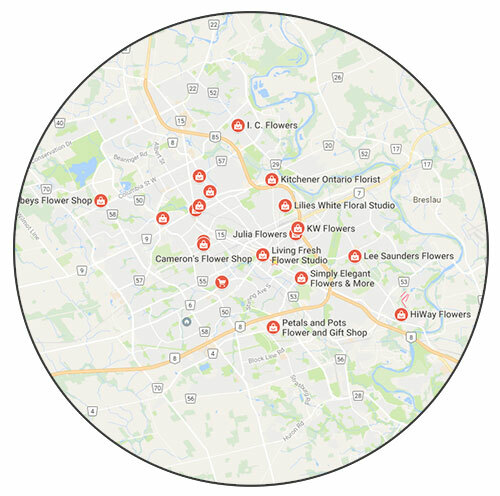 Searching for "Flower Shop Kitchener" brought up 500,000 results and the local results dropped by page 8. Google "My Business" will help. One of the best benefits is that it will geographically put you on page one if you are listed on Google Maps. Web searchers should be able to see you on page one in proximity to their location. 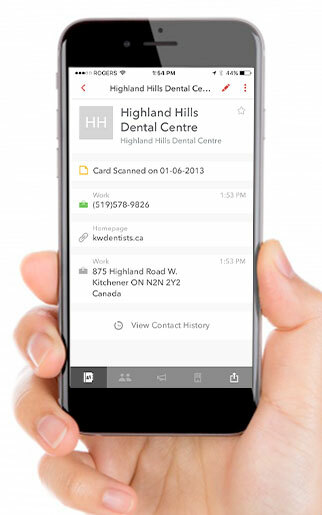 This is good if you are a dentist looking for new customers. 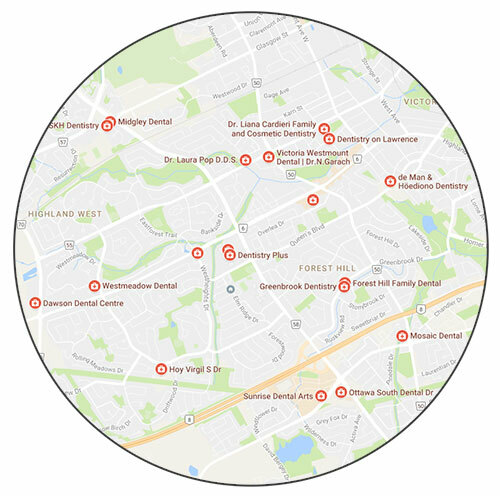 Doing a search for "dentist" brought up 20 locations within a 5 minute radius of my location. Don't lose business. If you don't need to advertise to maintain sales you should at least have a "digital business card" to passively do some of the selling for you. Look professional and established. Make sure your customers have a site to visit that is worth their time and positively reflects your business. If I have convinced you of the importance of updating your site and taking it seriously for potentially the first time then let's talk about how I can help you to improve your on-line image. You have enough to worry about day to day without having to figure out how to build a potentially lack lustre site. At Hawkeye Films we offer great product photography and can make you facility shine, we make professional youTube friendly videos and wrap it all up with appealing graphics and text that will positively reflect well on your business. We recently completed a new website.